Despite its fearsome reputation, a quick look at the run stats will reveal a relatively small number of black graded pistes, compared to what you might expect, but that is because much of the steeper terrain has been given the status of ‘off-piste routes’ which are not normally groomed or patrolled (although they are secured for avalanche danger). It’s also important to be aware that most published statistics, which for 2013-14 extend to 340km of piste served by 94 lifts, refer to the entire Arlberg region, which includes St Anton/St Christoph’s linked area; the separate Lech/Zurs area (accessible via a tricky off-piste route with a guide but more realistically for most on the bus); the newly linked Warth/Schrocken (linked by gondola to Lech, not St Anton); and several other smaller areas. So St Anton’s sector perhaps adds up to a third of that whole Arlberg figure, and when you take out those freeride routes, the kms of piste that are actually groomed and on your doorstep drops from triple to double figures. Those local slopes are divided into three main areas. Most famous, and arguably the area on which St Anton’s reputation is built, is Galzig-Valluga, reached by a spectacular modern gondola from the heart of the village. This provides access to bowl skiing and some long reds. The second main area, Gampen-Kapall, can be reached by the Nasserein gondola and offers more intermediate level terrain. Finally the separate Rendl Mountain is easier to reach than it used to be thanks to a newly realigned gondola that departs from a more central part of the village rather than the outskirts as it once did. This is often a good, quieter option when the off-piste terrain is awful and the pistes, particularly in Galzig, are crowded. Most of the legend that is St Anton relies on the tiny Valluga 2 cable car which climbs up the slopes to the region’s highest point at 2,811m and opens up some seriously extreme terrain. So serious in fact that you are not allowed to enter the cable car with skis or board unless accompanied by a qualified guide. Those challenges include the option to ski through the Pazieltal towards Lech, but are only suited to extremely skilled expert skiers who won’t be unnerved by the danger of death if a wrong move is made. However for the rest of us the top of Valluga 1 at Vallugagrat (2,650m) provides ample access to lots of steep and deep terrain, it is exposed to some of the most abundant snowfall of any area in Austria and much of the Alps. These are just some of the numerous itinerary routes, open bowls for which perhaps St Anton is most famous, chutes and steep gullies that abound in the sector – although it does have to be powder day for them to be at their most epic of course. Although St Anton is most famous for its off-piste terrain and un-groomed itineraries it’s a little known (and perhaps in the circumstances, slightly ironic) fact that it was here that trails were first groomed to make skiing easier – this was before automated machinery, just a few men with a hand-pulled roller flattening the snow surface back in 1949. Back in St Anton, some of the gentler terrain is found right next to the village where there’s an excellent children’s ski school area incorporating protected nursery slopes for young learners. More extensive gentle terrain with mostly blue graded runs are located in the Gampen area above. Intermediates are spoilt for choice, but should certainly take a look at the separate Rendl sector, reached by new gondola from the village centre and home to almost entirely red rated pistes with a maximum steepness of 40 per cent. There are still tough groomed runs for advanced skiers as well as all the freeride terrain. Mattun and Schindlergrat are infamous bump runs for example. The Ski Arlberg Pass includes the neighbouring ski slopes of Lech Zurs (reached by bus from St Anton) which has a tamer reputation than St Anton. 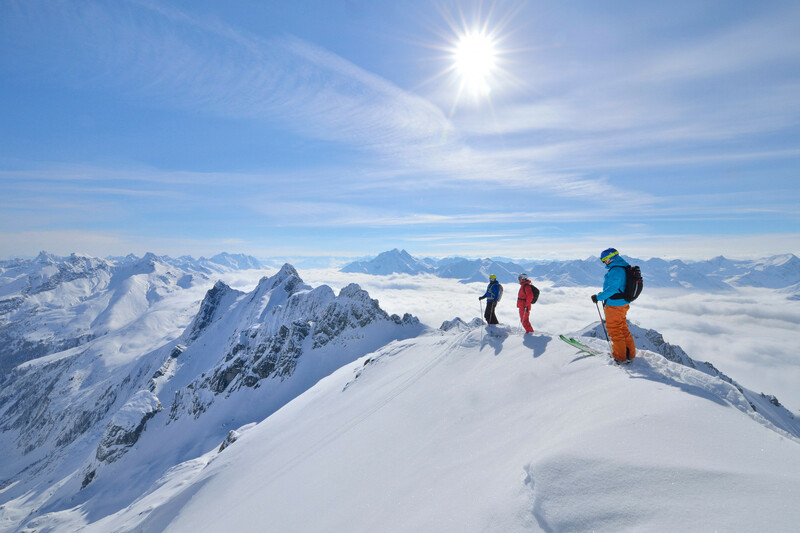 The pass has also been extended further for winter 2013-14 with a new gondola connection from Lech to a third sector, Warth Schrocken, offering another 60km of piste all on the one pass, now covering a giant 340km of groomed runs, one of the world’s five biggest ski regions. St Anton’s main terrain park is located on the resort’s Rendl mountain which has had something of a renaissance in recent seasons with a new lift, its base station closer to the resort centre and linked to the rest of the ski area, making it far more accessible and more of a core part of the St Anton scene. The Stanton Park is home to a plethora of kickers, ramps, pipes, boxes and rails and keeps getting larger each season. It now has three main lines, a Pro-line, medium line and jib-line so there’s something for all ability levels. The park has also been designed for easy access and fast laps thanks to its location next to two lifts. The Park is also located next to Rendl Beach which features a terrace, a bar and restaurant with the aim of creating a chilled, party atmosphere; helped by occasional events including snow volleyball tournaments and freestyle contests such as the compete in the O’Neill Kirschbaum Battle (http://www.kirschbaum.cc) each March. With the Ski Arlberg ticket you can access 4 more terrain parks ... as well as a newly created funslope on Galzig. The White Thrill race which takes place on Valluga each spring is one of the most exciting and testing races in the skiing world. Open to amateurs as well as pros, 500 competitors all begin the 9km race in a mass start, spread in a wide arc around the Valluga ridge. Getting a place in the race requires pre-registering with the tourist office long in advance. The race starts on an agreed date in late April. Competitors take the Valluga cable car to the start point 2,650m ready to set off at 5pm once the slopes below have been cleared for the 1,300m vertical descent over un-groomed terrain. But it isn’t downhill all the way: the race includes a 150m ascent up a 37m vertical. On the slopes, tackling tricky late afternoon spring skiing conditions, the competition is fierce and cut throat, particularly among the pros seeking to beat the record 7 minutes and 48 seconds time held by local boy Paul Schwarzacher, a member of the Austrian National Ski Team, who has won the White Thrill several times. For most racers however descent times between 11 and 18 minutes are a good average, and for the rest, the aim is just to get down and say you were there. Once back in St Anton, where a big screen at the finish follows the action, all rivalries are forgotten and St Anton’s other great strength, partying, comes to the fore for the evening. Der Bäcker Ruetz, Dorfstraße 31, A 6580 (+43 (0)5446 30303) is the main village bakery and is open from 6.30am daily so a great early stop if you want to grab the first turns of the day. There’s an option to pre-order your fresh baked goodies the day before if you wish. Cafe Haferl, Dorfstraße 20, 6580 (+43 (0)5446 3988) is a popular, cheerful and family -friendly breakfast spot on the main street. The restaurant is atmospheric with wood-lined walls laden with retro ski photography. There’s a kind of ‘breakfast happy hour’ with discounts for arrivals before 10am. Verwallstube Restaurant (+43 (0) 5446 2352-510) is run by head chef Bernhard Neuhold and located at 2,085m. It has built a reputation for wonderful gourmet cuisine such as exquisite Bouillabaisse et Aioli as well as Tyrolean delicacies and exquisite gourmet creations. Enjoy within spectacular surroundings including the peaks of Patteriol, Saumspitze, Kuchenspitze, Parseier and Valluga visible from the restaurant. Base Camp, Castle Hotel Bergschlössl, Kandaharweg 13 (+43 (0)5446 2220) is located at the bottom of the slope by the ski school and the Gampenbahn base station. Known for its good, home-cooked food, particularly the fresh pasta, there’s also a terrace which catches plenty of sunshine if you prefer to eat outside. Arlberg Hospiz, Skiclub Stube Parlor, Hospiz Alm, St Christoph 18, (+43 (0) 5446 3625) is one of four St. Anton restaurants selected by the prestigious Gault Millau guide. The Hospiz is where modern downhill skiing all began over 110 years ago, when friends got together here during the winter of 1900/01 to form the Arlberg Ski Club, which introduced the modern Alpine downhill style of skiing to the world. So it’s something special that you can sit in the same room, eat gourmet cuisine and sample the hotel’s spectacular wine cellar, one of the world’s best, including the planet’s biggest collection of over-sized wine bottles. Hazienda, m3 Hotel, dorfstraße 56-58, A 6580 (+43 (0) 5446 2968) has an eclectic, international menu thanks to the efforts of Chef Johannes Scherl and his team who have prepared a menu of international dishes, ranging from homemade pasta to the best Argentinian Angus beef, all served with locally sourced vegetables or fresh seasonal salads. Popular with locals, advanced booking is usually essential in peak season. The Museum Restaurant, Rudi Matt Weg 10, A 6580 (+43 (0)5446 2475) recently celebrated its centenary having been established in 1912. The building has a chequered history having been the headquarters of the local SS during the war and then fell into disuse before being renovated in 1978. It is now home to the St Anton museum which, given the resort’s history, is particularly interesting and there are rooms dedicated to Hannes Schneider along with other aspects of the resort’s history. The food is a creative mixed menu of fish, meat and vegetarian dishes, all well prepared to a high standard and there’s a good wine list too. Floriani Restaurant, Alte Arlbergstraße 13, 6580 (+43 (0)5446 2330) is a popular high-value, family-friendly pizza restaurant located close to the resort centre, 200m up from the Galzignbahn lower terminal. Known for its lively atmosphere, advance bookings and normally required because of its popularity. Krazy Kangaruh, Mooserweg 19, 6580 (+43 (0)5446 2633) at the base of the slopes is arguably the world’s most famous après-ski bar and thus a ‘must visit’ during your stay. Dancing on tables in ski boots while knocking back shots is the norm here and it’s almost impossible to get in between 4 and 7pm as it’s so popular (arrive by 3pm to bag your space). Don’t forget you still need to ski the final stretch back to the resort when the KK closes around 8pm so watch alcohol consumption. Mooserwirt, Unterer Mooserweg 2 (+43 (0)5446 3588) is the place that is tipped by some St Anton insiders as better, these days, than the Krazy Kangaruh. It’s certainly doing good business, recently expanding to add luxurious accommodation, and has the same “too popular” problem as the Krazy Kangaruh – normally impossible to get in much after 3pm as its packed full. Rumour has it the Mooserwirt sells more beer than any other bar in Austria. Get Snow Reports, Powder Alerts & Powder Forecasts from St. Anton am Arlberg straight to your inbox!